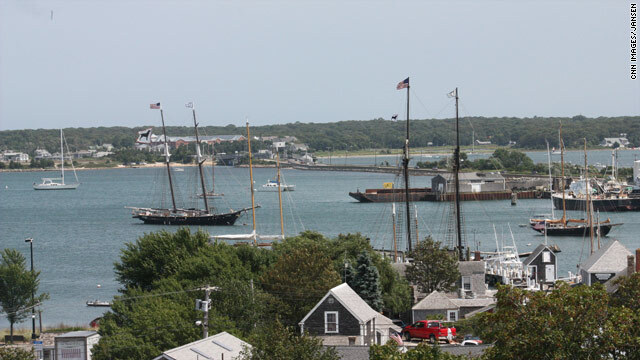 The harbor at Vineyard Haven on Martha;s Vineyard. President Obama will end his vacation on schedule and fly back to Washington, DC Saturday according to the White House. VINEYARD HAVEN, MA (CNN) - After a series of briefings on Libya, Irene, and the economy, President Obama hit the beach with his family Thursday, as many people onMartha’s Vineyardwere scrambling to exit the island. Ferries and flights were packed with passengers. Darren Johnson and his family were also waiting to board the same ferry. “We are cutting our vacation short by three days as we go through the storm so we’re absolutely unhappy,” he said. Those staying behind headed to a Vineyard Haven hardware store to load up on emergency supplies. Watson is used to this routine. While Martha’s Vineyard hasn’t been hit by a hurricane in years, he said just the threat always sends people scrambling. Some marinas on the island that were packed with bobbing boats just a few days ago emptied out. 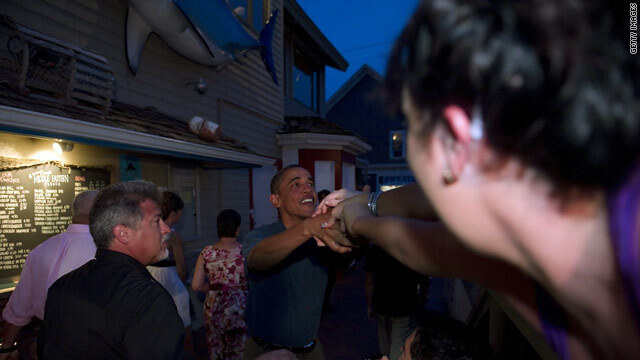 President Obama greets onlookers outside an Oak Bluffs restaurant on Martha's Vineyard Sunday night. (CNN) Martha's Vineyard, MA–Strong words today from President Obama as the situation in Libya deteriorated. "It's clear that Gadhafi's rule is over," the president announced once again calling on the Libyan strongman to step down. But the president cautioned that the situation in Libya remains fluid and his administration continues to monitor "fierce fighting" in some areas. This on-camera statement from Mr. Obama at his vacation home on Martha's Vineyard ended two days of high-level talks, as well as late night and early morning conference calls with the president’s national security team – all amidst a family vacation. On Sunday, the CNN team that was part of the White House travel pool gathered in the early morning to follow the president's movements. As the situation in Libya intensified, reporters clamored to find out if the president would speak on camera. The White House’s official response was, "not at this point." The day progressed and the travel pool followed the president's movements from a morning at the beach to an afternoon of golf and a reception at the oceanfront home of a powerful media executive. And still no statement from the White House on Libya. 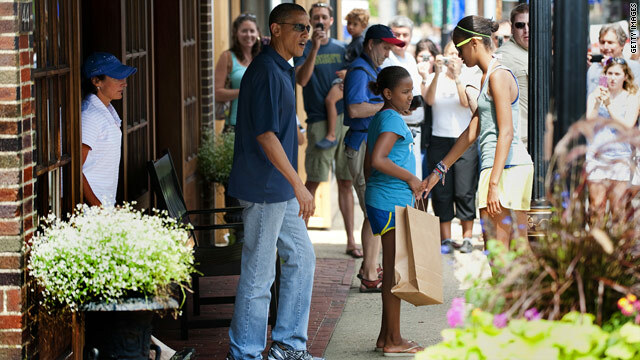 MARTHA'S VINEYARD (CNN) - President Obama and his daughters, Malia and Sasha visited a local bookstore in Vineyard Haven to purchase some books for their summer reading. No official word on what books the girls bought but White House officials say the president bought two books for himself: The Bayou Trilogy, a collection by Daniel Woodrell and Rodin's Debutante by Ward Just. The White House also said Mr. Obama brought several books with him to read on the trip: Cutting for Stone, a novel by Abraham Verghese; To the End of the Land, a novel by David Grossman; and The Warmth of Other Suns, which is the story of America's Great Migration, by Isabel Wilkerson. President Obama joined Michelle and the girls for their third annual trip to Martha's Vineyard but it hasn't come without criticism as some say he should stay home to juggle a bad economy, mounting pressure on Syria. But White House aides point out that while he might be away from the White House, he's never away from his job. CNN White House Correspondent Dan Lothian explains.